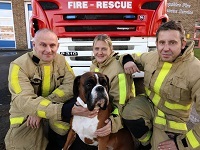 Shropshire firefighters helped tick off one more “bucket list” wish for the owners of a Boxer dog with just a few weeks left to live. Firefighters made a huge fuss of Ralph and the four-year-old pet’s owners Stephanie Malia and her parents Julie and Ed Malia, landlords of The Wickets Pub in Wellington. They had asked for their beloved pet, who is a lookalike for the Boxer in the John Lewis Christmas TV advert, to meet firefighters at Wellington fire station as he “just loves” fire engines. Ralph has already enjoyed a drive by burger at McDonalds on the Wellington Retail Park, a pamper day including a wash and massage, a trip to a doggy hotel in Llandudno, a walk on the beach and he’s had his portrait painted. Ralph is the seventh Boxer in 30 years owned by the family. “After breaking our hearts on hearing the news from the vets we decided that we wanted to make his life as full as possible and we began the bucket list and people have been adding to it,” said Julie. Next on the list is a sit in a police car, an ice cream and to watch a sunrise and a sunset. Ralph is also due to feature in a calendar for 2017.